On Wednesday of this week (12/2), as we previously announced, our special chumby insider price of $99.95 will expire — and the price of chumby one will be $119.95. Still an amazing price for the newest chumby. And we’ll even throw in free domestic ground shipping: that’s a $9.95 savings. So you have one more day to get in at the $99.95 special price — what are you waiting for? And you better tell your friends. Also please note that while we originally expected to be able to continue to price multiple unit orders at $99.95 per chumby, we’re unfortunately no longer going to be able to do that — so our pants are on fire, at least for now. Here’s why. The demand for the new chumby one has, we confess, exceeded our expectations. It now looks like it’s going to be tough to get enough chumby ones manufactured and shipped to everyone who is likely to want one in time for the Holidays. For those of you who have already ordered chumby ones, don’t worry, you’ll be getting them — we’re only worried about running out in a couple of weeks if demand continues at its current pace and we can’t get more produced faster. Correspondingly, we can’t really afford to offer discounted multiple unit sales now. But, again, we are offering free shipping with the new price — we figure it’s the least we can do. Some of you are grumpy (and rightly so!) that we slipped the ship date for the chumby ones you ordered. Again, the issue is our getting sufficient chumby ones fast enough to keep up with demand. 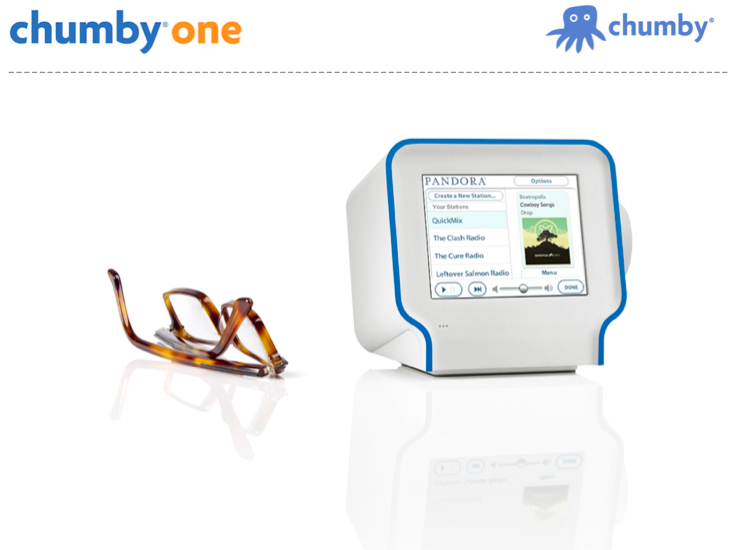 If you ordered your chumby one on or before November 15, your chumby is expected to ship by December 3 — yes, *this* week. If you ordered after November 15, we’re planning on shipping your chumby ones out to you by December 11th. While having more demand than we can handle is supposed to be one of those “good problems” for a company like ours, and especially in this economy, we recognize that we’re disappointing some of you with these shipping delays — so thanks for your patience in bearing with us. We hope you’ll be pleased enough with your new chumby one that you’ll forgive us. This special pricing will only last through the end of November. It’s our way of thanking our chumby friends who are paying attention :^) And also a way to thank those of you willing to wait a bit and live with our current inventory situation where we’re selling chumby ones faster than we’re making them. Sorry for the queue, but more chumby ones are on the way!